After shampooing with our Hydrating shampoo, apply a generous amount of treatment to hair. Gently work through hair, making sure to cover ends. Wait 3 minutes, then rinse thoroughly. Everything you need to quench and soften. Rated 5 out of 5 by Cleanfreak from Good This made my hair soft. Is Garnier discontinuing this line? Because in Target today I didn't see the shampoo & conditioner at all. They were all gone :( Please let me know. Thank you. Rated 5 out of 5 by Cute one from Its really good This hair mask worked good for my hair. Its what my hair needed hydration. It made it so soft, & feels better. It was also easy to comb my hair out because lately I been having tangles, & this helped. I also used the shampoo from this line. I think the shampoo was good also. Thank you, Garnier. Please don't discontinue this. Rated 5 out of 5 by bzzagentDemiline3 from Garnier Does It Again! I've used a lot of hair care products and more times than not, I find myself enjoying and being surprised by the drug store brands. 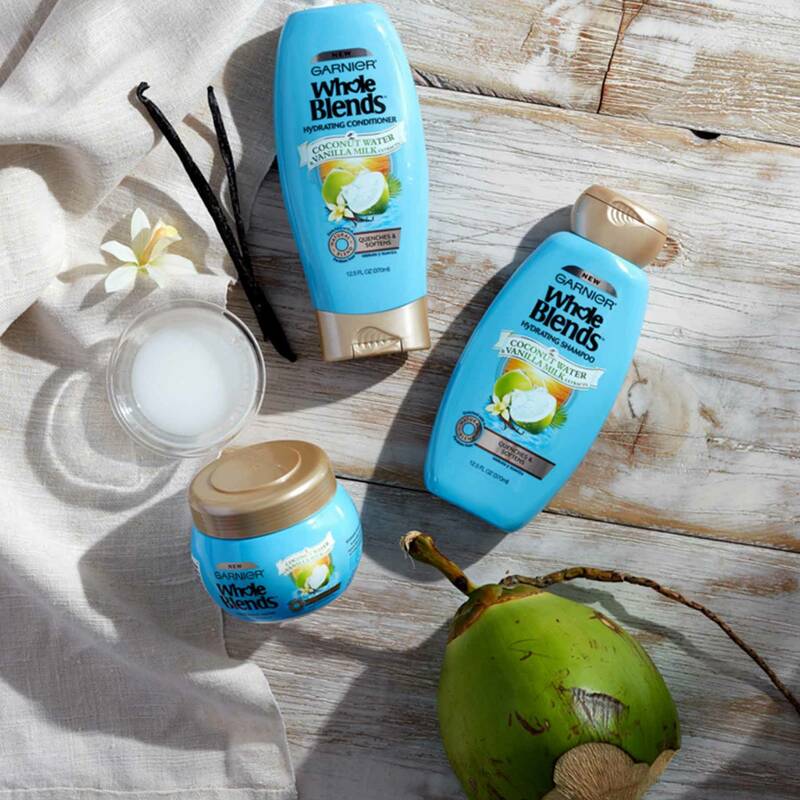 Garnier's Whole Blends line feels fancy without the fancy price tag. Better yet, it proves to be effective as well. I've loved how this mask has made my hair feel silky in the dry heat of summer. I love the thick consistency and the gentleness of it. It smells divine too, which is always a plus. Try it out if you want moisturized, shiny locks! 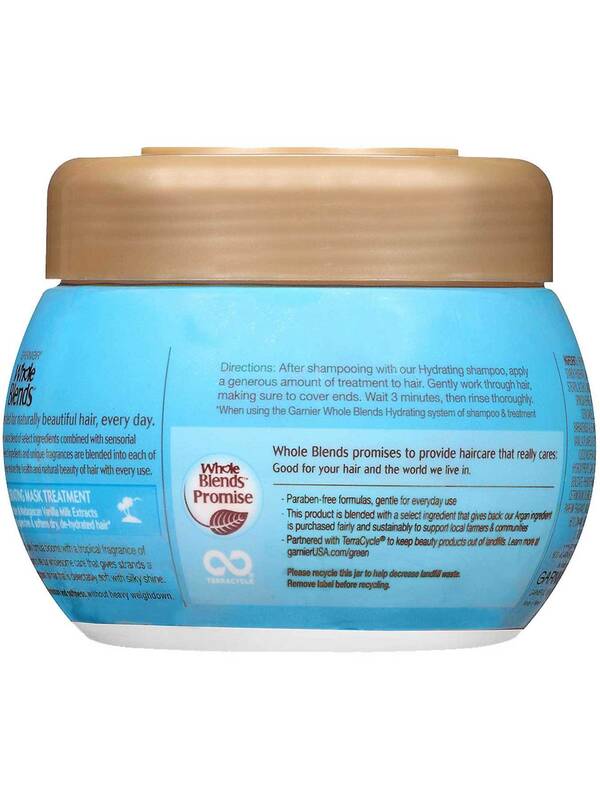 Rated 5 out of 5 by jackiemayes412 from Great hait product I love this hair product. I use everytime i wash my hair and need my hair to stay soft and hydrated. It light wieght and smell great and i cant wait to purchase it. And try the other product like it. 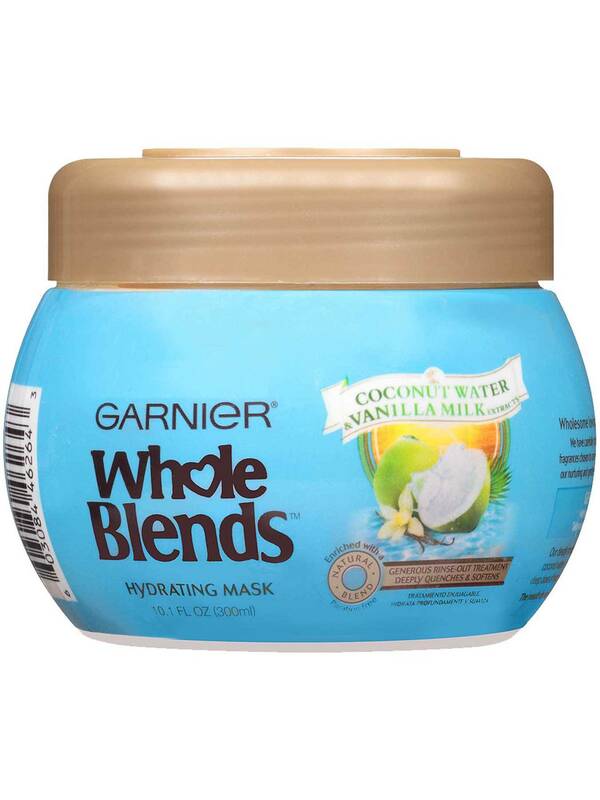 Rated 5 out of 5 by Ging29 from Great conditioner I love Garnier Whole Blends hair mask with coconut water and vanilla milk extract! The formula is so creamy and rich. The scent is subtle, not overpowering, which I really liked. This conditioner smells so good! I have fine hair and this conditioner did not weigh it down at all. I also bleach my hair and have a lot of damage and split ends. After using this conditioner my hair was so shiny and soft and very easy to style. I will definitely be using this conditioner from now on. I highly recommend it. Rated 4 out of 5 by Sarah43 from Great Hair Mask I don't usually do hair mask but thought I would give this a try!! I was pleasantly surprised at how good it worked. My hair was so much more manageable and I was able to brush it out with no problems!! I also have very dry hair and it helped keep my hair hydrated and silky smooth.It also smells so good and leaves my hair looking so healthy!! I would recommend giving this a try It is so worth it. Rated 3 out of 5 by jessjess8 from 3.5 stars if that was possible The product is OK. I was happy with it, but not sure it's better then ordinary conditioner as far as helping my hair. It smells AMAZING. My hubby even commented that my hair smelled really good. Seriously, I LOVE the smell. It did work nicely as a conditioner, just nothing amazing. I'm not sure how much I like the container. It's a fun shape and it's neat that it's different then a regular shampoo/conditioner bottle. Scooping it out made me feel like I was using something fancy. It's not so practical in the shower though. I've bough other leave-in hair products in similar containers and that was fine, but to have to twist off the top of this one while in the shower with wet hands was hard. It was also kind of annoying/difficult to scoop out while making sure not to get water in the container (yes, I could turn off the water while applying but then I'll be cold and that just isn't fun). And then I had the same wet-hand problem screwing the lid back on after. SOO in summary, it smells great. Worked nicely, though not better then other conditioners. I won't buy it though because it just isn't conveniently packaged. Thanks for the free sample though! Rated 4 out of 5 by kharrod from Great Hydrating Mask! My hair can get dry, unruly and unmanageable at times.... but this hydrating mask really did the trick. It moisturized my hair without weighing it down and leaving any residue. I loved the subtle scent of coconut; it made me feel like I was on a tropical vacation. Overall, I think this product is a winner and it left my hair silky soft and manageable.